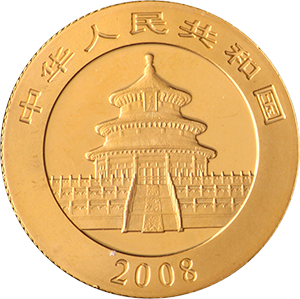 Gold Panda Coins are gold bullion released annually by the Chinese government and were first introduced in 1982. The early to mid-1980’s were a boom time for governments around the world to produce gold bullion coins, with the Canadian Maple Leaf, American Eagle and Britannia all releasing their own versions, all of which still exist today. The Gold Panda coin still remains one of the most traded items on the bullion market, however. 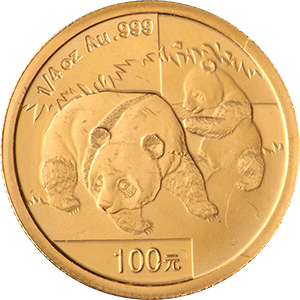 The 1 oz Gold Panda has a diameter of 32mm and a thickness of 2.7mm. This changed from the original design in 2016, when the coin’s dimensions were slightly altered to accommodate the metric system. It is thought that this change was more significant for investors than collectors, partly because the coin’s gold content increased slightly, but also because many investors around the world prefer to calculate weights in ounces. The coin’s gold content is of the very highest purity at 24 carats, which makes them 99.9999% pure gold. 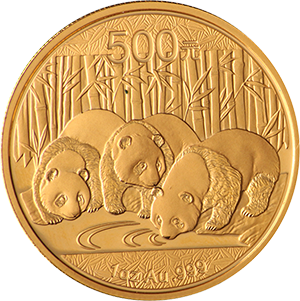 The Gold Panda Coin’s design is changed yearly, which makes it almost unique amongst government minted coins (the Australian Nugget also annually changes its design). While the design is altered each year it is always based on the Giant Panda, the iconic Chinese symbol. The only year in which the Panda design was not altered was in 2002. On the coin’s obverse is the Temple of Heaven, with The Republic of China written in Chinese and the year of release surrounding it. The Chinese Panda is legal tender, but its face value (100 yuan up until 2000 and 500 yuan beyond for the 1 oz version of the coin) is just a fraction of its true value. As with all gold bullion coins, its price will depend on the global price of gold and the coin’s condition.